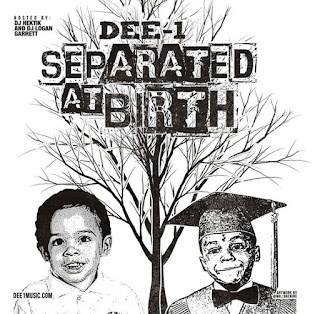 Here's the latest release from Dee-1's upcoming mixtape Separated At Birth. Dee-1 says "it is no secret that when looking to define success at a young age, especially in an underprivileged environment, there are few places one will turn. If you're from the hood and want to be successful, the media portrays three clear options to do so. You can be an athlete, you can sell drugs, or you can be a rapper. When one has little guidance and looks outside to see only the dope boys and rappers pulling up in flashy cars and owning flashy material possessions, it is easy to understand how these figures are positioned as idols and influencers. The issue that arises with rap artist being such high profile celebrity figures in their communities is that so much of the content they share is misleading and degrading. The goal of this conversation is not to call anyone a liar or point fingers, but moreover to encourage hip-hop to look in the mirror and understand the vast influence that it has on culture, the youth’s perception of reality and defining success." In “Call Yo Bluff” Dee-1 has a conversation with Lil Wayne, who he has commended to be one of his biggest influences as an artist. Focusing on the lack of transparency in music and the need to deliver more empowering messages through music. Dee-1 uses “Call Yo Bluff” as a creative avenue to call out the music industry for its impact on the culture. “My lil homies bump you, and my lil dogs look up to you, but your food for thought don’t fill them up” “It’s only about income for you” Dee-1 states in this conversation with Tunechi, “Let’s meet in Hollygrove for coffee/ and talk about all our people that’s dead lying in coffins.” As a New Orleans native Dee-1 analyzes Wayne’s content and influence to make an example for a conversation about hip hop that although may be somewhat uncomfortable, but is a conversation that needs to be had.